Zion Market Research has published a new report titled “Neuroprosthetics Market by Type(Output Neural Prosthetics and Input Neural Prosthetics), by Technique (Spinal Cord Stimulation, Deep Brain Stimulation, Vagus Nerve Stimulation, Sacral Nerve Stimulation, and Transcranial Magnetic Stimulation), and by Application (Motor Neuron Disorders, Physiological Disorders, and Cognitive Disorders): Global Industry Perspective, Comprehensive Analysis, and Forecast, 2018 – 2024”. 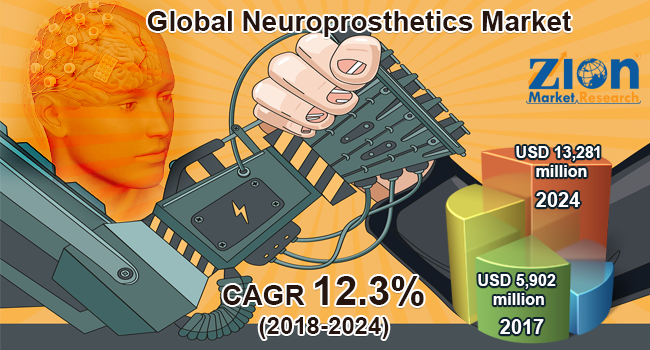 According to the report, the global neuroprosthetics market was valued at approximately USD 5,902million in 2017 and is expected to generate revenue of around USD 13,281 million by the end of 2024, growing at a CAGR of around 12.3% between 2018 and 2024. Neuroprosthetics is rapidly progressing nowadays, courtesy to intense clinical and scientific research. The developments in this filed are seen since 1932, when the cardiac pacemaker was introduced. These developments include deep brain stimulation, techniques for bladder and bowel control, cochlear prostheses, mobility restoration, and respiratory solutions for paralyzed individuals. Neuroprosthetics support the output and input of the nervous system. These days, numerous different surgical brain implants are tested for their capabilities to repair and restore severe motor sensory functions disabilities. Growing incidences of cerebral stroke and other severe disorders, such as epilepsy, Alzheimer's, and Parkinson’s, are projected to fuel the demand for neuroprosthetics devices, thereby, driving the neuroprosthetics market growth. Around 50 million Americans are suffering from the a forementioned disorders, according to the National Institute of Neurological Disorders and Stroke (NINDS). This is leading to high occurrences of diseases, economic burden related to therapeutic expenditure, and loss of productivity. Hence, the neuroprosthetics market is anticipated to witness substantial growth over the forecast time period. The global neuroprosthetics market is segmented based on type, technique, and application. By type, the market is segmented into output neural prosthetics and input neural prosthetics. The output neural prosthetics segment is further sub-segmented into motor prosthetics and cognitive prosthetics. The input neural prosthetics segment is further segmented into the cochlear implants and bionic eye/retinal implants. The output neural prosthetics segment accounted for the largest market share, owing to increasing adoption of motor prosthetics due to Parkinson’s and epilepsy. By technique, the market is segmented into spinal cord stimulation, deep brain stimulation, vagus nerve stimulation, sacral nerve stimulation, and transcranial magnetic stimulation. The spinal cord stimulation segment is likely to hold the maximum market share during the forecast time period. The deep brain stimulation application segment is anticipated to grow at the highest CAGR over the forecast time period. The application segment includes motor neuron disorders, cognitive disorders, and physiological disorders. The motor neuron disorder segment is further classified into Parkinson’s disease and epilepsy. Physiological disorders are sub-segmented into auditory processing disorders, ophthalmic disorders, cardiovascular disorders, and urology disorders. The cognitive disorders segment is further sub-segmented into Alzheimer’s and paralysis. Growing incidences of malicious disorders including Parkinson’s and Alzheimer’s simultaneously with other inherited neurological disorders has led in the increased need for new improvements in neuroscience industry, which will significantly boost the neuroprosthetics market during the forecast time period. The physiological disorder segment holds the largest market share due to the increasing prevalence of auditory processing disorders globally. North America, Asia Pacific, Europe, Latin America, and the Middle East and Africa are the key regional segments of the global neuroprosthetics market. Europe and the Asia Pacific are projected to remain the leading regions in the forecast time period. China and India are among the leading countries that are contributing a major share in the neuroprosthetics market in the Asia Pacific. Due to the increasing geriatric population and rising incidence of CNS disorders, the developing countries dominate the Asia Pacific region. Furthermore, the region is expected to grow at the highest CAGR during the forecast time period. Some key players in the neuroprosthetics market are Medtronic, Abbott, Cochlear, Boston Scientific, Livanova, Second Sight, Med-El, Retina Implant, Sonova, Neuropace, NDI Medical, and Nevro, among others.